Enjoy 3 days of immersed care and solo reflection time. During your retreat you will have a beautiful comfortable peaceful room to rest in. You will be provided with delicious, whole food (macrobiotic seasonally based) vegetarian/vegan meals per day, daily yoga and meditation practices to support your inner work and foster a sense of body, breath and spirit connection and wellness spa/body work treatments. In the evenings your will have the opportunity to sink into a deeply relaxing yin yoga practice followed by a crystal singing bowl sound journey. You will arrive in the afternoon and settle into your beautiful, comfortable, peaceful room. After landing you will have the opportunity relax and settle in, followed by a delicious healthy, seasonal dinner. In the evening we will enjoy a gentle yin yoga practice followed by a crystal singing bowl sounding. During day 2 you will have the option of joining us for a do-in (meridian awakening practice) or yoga practice and meditation. Followed by a seasonal breakfast and herbal tea. either during the morning or the afternoon you will have to opportunity to feel the gentle, balancing effects of a zen shiatsu body treatment. During the day you will also have personal time to read, write, or walk in nature, and time for a delicious whole food macrobiotic lunch and dinner and evening yin yoga with sounding journey. On day 3 you will enjoy morning yoga and meditation, a delicious brunch and some free time or optional addition treatment(see below for additional treatment pricing) before you head back home in the afternoon or the following morning. Give yourself some additional time to relax and be present in your self care. Stay an extra night and enjoy another zen shiatsu treatment before heading home. Rate for additional night $80 plus any treatment fees. Dreaming of a yoga vacation? Have you been dreaming of getting out into beautiful, natural surroundings and find some peace and connection to your well being? Does life seem to be out of balance and have you racing? Would you enjoy a beautiful simple experience with a small group in a rejuvenating yoga vacation? Would you like to learn or develop some simple life balancing practices? Our yoga retreats are focused on yoga including vinyasa and yin, meditation, whole healthy food, and beautiful, connective experiences in nature. A big component of our yoga weekend retreats is taking the time to be with nature. Wether its watching the sun rise or set in meditative silence, or gently exploring the local floral and fauna. Our yoga retreats are all about enjoying the ebb and flow of the ocean, or the trickling of a stream the easiest way to feel connected and at peace is through observing the elements whether it’s a yoga retreat in a tropical location or a local retreat in cottage country. Food is natural, whole vegetarian food that is relevant to the season and location of the yoga vacation or yoga weekend retreat, with discussions on why this food is appropriate for yin/yang balance and on living a holistic, balanced lifestyle. Personal time is also valued, as this is a large part of finding peace within ourselves. Our intention is to give you a gently guided, warm hearted space to connect with your well being and to find delight, magic and abundance in daily life through a deeper connection to yourself and your surroundings. 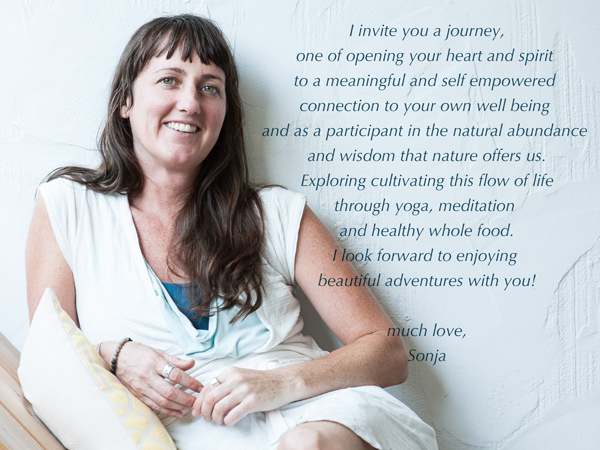 Join Sonja for a seasonally aligned weekend of yoga, meditation and natural plant dyeing. Throughout the weekend you will be infusing your intentions into a garment that you will dye with medicinal plants. We will attune our body, breath and spirits to the elements of the Spring, soon to be Summer, with yoga practices, taking advantage of the energies of the coming New Moon, we will create space to meditate and journal on the intentions we would like to bring into our lives and infuse these into our high vibrational medicine garment. Join Sonja and Guest for an alignment to the abundance of the Fall season. We will harmonize to the elements with yoga, meditation and forest bathing. As we harmonize with the elements and gifts of the forest we will see what natural abundance and treasures are available for our forage & feast. We will casually have some natural dye baths going with some of our foraged plants to play with, so bring some items you like to play with. Join Claire Turner Reid and Sonja den Elzen for a restorative, nourishing, and empowering weekend of meditation and movement practices rooted in Traditional Chinese Philosophies. This weekend retreat will be an immersion into Qigong, Yin Yoga, and Sound Healing to help support healing, longevity, and harmony. We hope you will go home at the end of the weekend, nourished, calm, in flow and have learned some foundational tools for cultivating and balancing your Qi (energy), body, mind and spirit and not only be in more harmony with yourself and the natural world around you, as well as having a deeper understanding of your relationship with the elements. Check out our retreat space, Cedar Healing Arts, for upcoming retreats in Muskoka, Ontario. Connect with nature and nurture yourself. We have personal self care retreats and group retreats. Our sunrise yoga practices with Sonja were magical. Sign up to find out about upcoming retreats. We look forward to enjoying a beautiful retreat experience with you! Send me retreat and wellness updates.